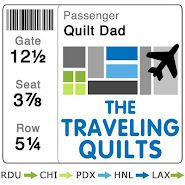 Quilt Dad: Let your peeps flag fly! Let your peeps flag fly! Want to see the first thing I sewed at my new house? Yes, the boxes are not yet unpacked ... but I set up a makeshift cutting table in order to make this, my newest original creation: the Peeps Flag! 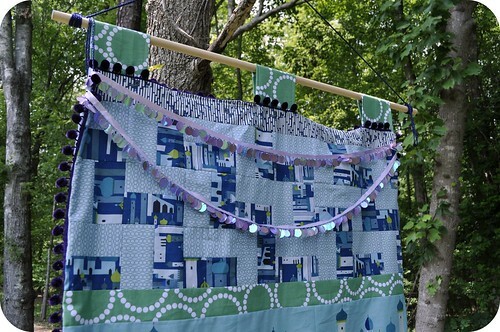 In case you missed it, the fabulous Lizzy House asked the Fat Quarterly team to serve as camp counselors for 1001 Peeps Summer Camp, her series of free project ideas made by guest designers from her newest fabric line, 1001 Peeps. 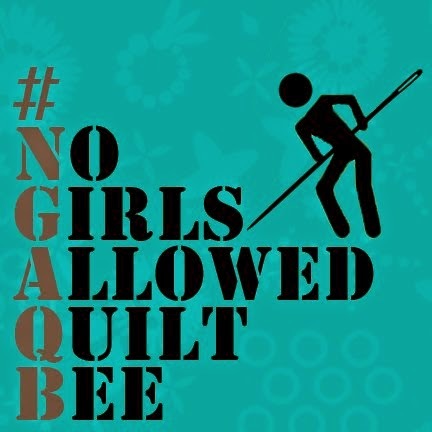 I couldn't wait to get my hands on the fabric (LOVE the peeps!!) and immediately came up with this project idea. I posted the free tutorial over on the Fat Quarterly blog (link below). Hope you like it! Here's a helpful hint: if you start making a Peeps Flag at 10PM the night before it's due, you'll finish it at around 4AM. Ask me how I know this. If you make a Peeps Flag, please let me know -- I'd love to see it!! Sorry, but I am "hopefully" sound asleep at that time. I think I would need to do this during the day for fear of sewing the tips of my fingers right into the project. It is gorgeous! I, too, have finished many a project at 4 AM. Those nights usually just turn into all nighters for me. I wake up at 5:45 each morning anyway, so when I get finished with a project any time after about 3 AM, I just start another... What is the point of "going to sleep" for less than 2 hours? Love your Peeps Flag! Having just moved myself, I would love to see some pictures of the new house!! Love the flag and the trim you used on it! Awesome flag!! Nice colors and trim. I LOVE THIS PROJECT! a lot. that's why I used caps. Thanks John!! John I 'proper love' (said in my bestest Yorkshire accent) this fab flag. I am so making one of these for my son's room!! I love that you made this... when the line came out I totally got sort of an "Arabian Nights" feel from it and this flag certainly exemplifies that! Now that you made this... where will it hang!? Ha, pretty cool, it looks like one of those old medieval standards! ah! That's REAL cute! I need a house so I can hang a flag!!! I'm definitely going to be making myself one of those. 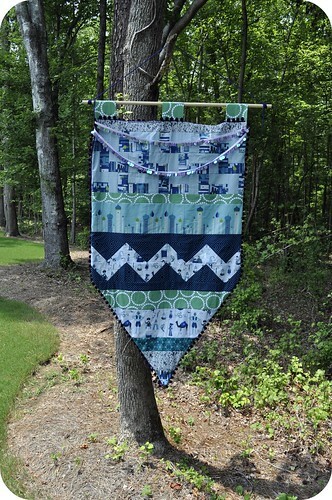 I loved your summer camp project and started working on it as soon as I saw it posted! Here's my finished flag! Love those 4am creations! The Peeps Flag is awesome. I think Lizzy's Green Pearl Bracelet is one of my favorite new fabrics. Great creations are done here.